It looks horribly ugly, but drives very nicely. When it wants to drive nicely that is. I recently bought it used, and it has needed a thousand dollars worth of repairs just to simply get it back on the road again. The check engine light has come back on again, and I think it will probably cost me another thousand to fix whatever's wrong under the hood. I bought this vehicle as I was told that my Ford was going to cost more to fix than it was worth. Honestly, I think I should have stuck with the Ford. I would already have a completely fixed, safe vehicle for less than I've spent on the Santa Fe to repair it and purchase it second hand. The Santa Fa has easy handling, and a nice comfortable ride. Good for the money. It rides good, gas mileage is fair, but it is and older car. It's not big enough, I have a german shepherd and it's by no means large enough, or high enough for my dog. Storage space is okay, I guess it depends on how much space you need. Love having the roof rack, it's a necessity for us, my husband can tie his fishing rod case on there and it works quite well. The biggest issue is whenever it rains the ride is VERY sluggish, it feels like it's going to stall, and sometimes it does. We"ve kept up with maintenance but still have this issue. The 2003 Hyundai Santa Fe is a great vehicle! It is very roomy and comfortable. One of the most reliable vehicles we have ever owned. We bought it out right for around $3, 000. Well worth it. We have used it for family vacations. We go to Valdosta at least once a month and it travels really well. Also good on gas! Highly recommend for families of 5! Certain 4-door sport utility vehicles fail to comply with the requirements of Federal Motor Vehicle Safety Standard No. 120, "Tire Selection and Rims for Motor Vehicles other than Passenger Cars." The tire pressure labels do not contain the information required by the standard. Owners will be provided with a correct label and installation instructions. The manufacturer has reported that owner notification began on December 22, 2003. Owners may contact Hyundai at 1-800-633-5151. On certain sport utility vehicles equipped with 3.5-liter V-6 engines, 4-wheel drive and antilock braking systems (ABS), if the brake pedal is depressed at speeds between 3 and 12 mph when the brake pad friction surfaces are wet, a vibration may occur between the brake discs and pads causing ABS sensor electronic signal noise to develop. At speeds below 5 mph, the ABS sensor signal noise may cause the ABS electronic control unit (ECU) to activate the ABS, extending the stopping distance. If an extended stopping distance occurs, it could result in a crash. Dealers will reprogram the ABS ECU. The manufacturer has reported that owner notification was expected to begin during April 2004. 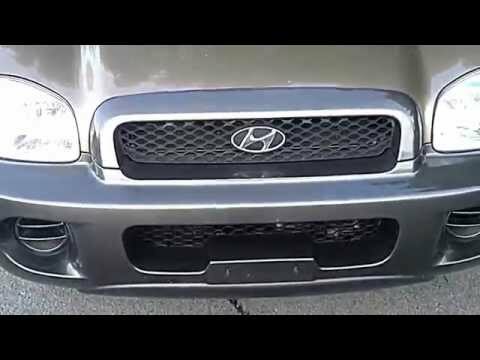 Owners may contact Hyundai at 1-800-633-5151.